Sometime just tweeting a URL is not enough to make the users more engaging and bringing traffic to your website or app. So Twitter introduced “Twitter Cards”, using which we can make Twitter can generate a summarised preview of of our website or app and also provide basic information about what the webpage contains. 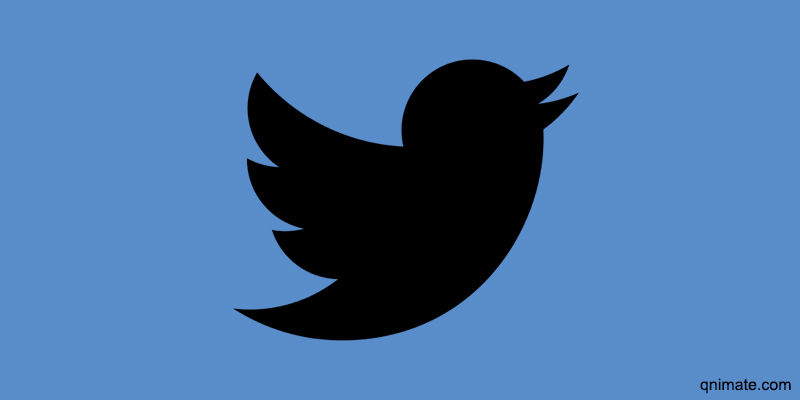 Twitter card is a preview of a URL tweeted. This card is produced by twitter by crawling twitter card specific meta tags from the tweeted web page. 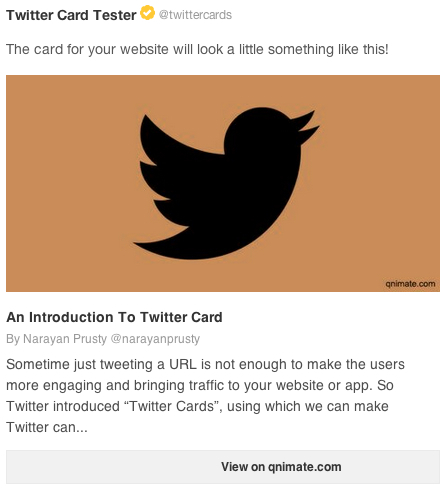 There are different types of twitter cards, used based upon what the tweeted URL is about and way to convey better summary and experience to users. Summary card is used when your URL points to a standard webpage i.e., contains mostly textual information. From WordPress point of view, this card can be used for standard post formats. This is same as summary card but used when your want to display a larger size image. From WordPress point of view, this card can be used for image post formats. Photo card is used when URL represents a page that displays a image. Useful when a page is for downloading or previewing photo. Gallery card is used when URL represents a page that displays a image gallery. From WordPress point of view, this card can be used for gallery post formats. App card is used when URL represents a page that provides information about a mobile app. Twitter auto-creates App Cards for Tweets which contain a link to either the App Store or Google Play. This means that you can create an App Card experience just by sharing links directly to the download page for your application. App card is only available for twitter mobile app but not available for mobile or desktop web. The image for the App Card is downloaded directly from the app market on which your app resides. Product card is used when URL represents a page that provides information about a eCommerce product. Product card is used when URL represents a page that is used to play a video, audio or any other media. For creating a Player card you need to verify your twitter card from Twitter. They don’t allow you to create and tweet player card without their permission and verification. For more information creating and verifying twitter card click here. These cards are only available if you want to run a advertising campaign in twitter. Twitter needs approval before displaying the cards in twitter. Once your website has the twitter cards code in it. You need to visit Card Validator link and then provide your personal details as you will be the owner of all the cards of your website. After filling the details click request approval button. Approval process takes few hours. For complete official documentation on twitter cards visit this link. I covered all basic types of twitter cards and this will be enough for most cases. Thanks for reading.